As I continue to work on my graduate school applications, I’ll share another piece from the OP archives. This one, published about two years ago today, is among my favorites, no less because it’s dedicated to and partly inspired by my darling little sister Therese, one of the very kindest and wisest people I have the privilege to know. I have several OP pieces in the works and will be publishing a new piece soon. In the meantime, I hope you enjoy my essay on the Little Way of Goodness! Growing up Catholic, my siblings and I were taught many stories of saints and their heroic exploits in their quest to attain union with God. 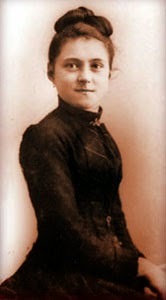 One of these was Thérèse of Lisieux, a young Frenchwoman who became a nun at 16, and died of tuberculosis at the early age of 24. She was an especially beloved saint of my family; one of my sisters is named after her. This entry was posted in Ethics & Morals, Religion, Written by Amy Cools. Bookmark the permalink.